Home / Thailand’s freedom seeds network: Can Jack face the giant? In the past, seeds were always in the hands of farmers. After the harvest, they would set aside a portion of their crop to reuse as seeds for the following season. Commonly, they would exchange with their neighbours in the community or with people they knew in other communities. However, the culture and methods of collecting and conserving farmer-saved seed has been gradually disappearing since the establishment of the International Rice Research Institute (IRRI) and the International Maize and Wheat Improvement Centre (CIMMYT) around 50 years ago. At around the same time, research projects were beginning to be developed at Thailand’s own research institutes looking into the potential for new seeds. For example, the Rice Department and the National Maize and Wheat Research Institute set up new national research programmes which received funding support and close collaboration from international agricultural research institutes, including joint research projects, seed exchanges and training projects and study visits, etc. The state and relevant government agencies believed that the replacement of indigenous seeds with government promoted seeds would increase yields, and farmers’ incomes, which would improve their lives. Other business sectors would also profit as a result. They were not concerned with the extent to which the change from indigenous crops to new improved varieties would require the increased use of fertilisers and chemical pesticides as a result. Private sector companies began to play a role in the production of crop seeds since the introduction to the Thai market of new temperate varieties of vegetables from China and Taiwan. Then, after the National Maize and Wheat Research Centre had been successful in developing the Suwan1 maize variety to the point that it was taken up by farmers all over the country, Thai agribusiness giants and multinational corporations saw the opportunity and began in earnest to enter the Thai crop seeds market. The policy to promote investment and allow private companies to use the state’s genetic resource banks, opened the way for the Charoen Pokphand company along with multinational corporations, such as Monsanto, Cargill, Pioneer, Pacific, Syngenta, to gain control over the market for maize seeds and many other annual crops over a period of less than two decades. Government agencies whose main role used to be producing seeds for distribution and sale to farmers, have made it their duty instead to support the business of the above companies by providing germplasm for plant breeding and field stations to test the quality of the seeds which are commercial products of various companies. The successful monopolisation of crop seeds has come about as a result of the strategy of private companies and the government agencies in developing and promoting hybrid seeds, which farmers cannot keep for replanting in the next season. Under the investment promotion policy, Charoen Pokphand and multinational corporations have been able to monopolise vegetables seeds, maize, sweetcorn, sorghum, and sunflowers. In the latest news, the Thai government has increased its support for the investment of Bayer and Charoen Pokphand to produce hybrid rice seeds. Over just 30 years of the green revolution in Thailand, the market in seeds for domestic vegetables and various annual crops has come under the control of a small number of corporate agribusiness giants. Rice seeds remain virtually the only sector which these companies are not yet able to control. However, this situation may not last, as at least two companies are lobbying hard for the recognition of hybrid rice seeds which could given them an effective monopoly over the rice seeds market. It is greatly worrying that Thailand’s food security may soon be entirely in the grip of just a few Thai and foreign multinational companies. It has been more than 20 years now since a very small farmer’s group in Yasothorn began to select rice seeds to create their own rice variety based on Jasmine 105 (Thailand’s best-selling premium rice variety). They had noticed a problem. The seeds they had been getting from the government rice seeds centre tended to be mixed up with other varieties. At around the same time, Decha Siriphat established the Farmer School in Suphanburi province, which later evolved into the Khaaw Kwan Foundation, developing local knowledge in seed selection and offering training courses several times a year for farmers who are interested in developing their own seeds. 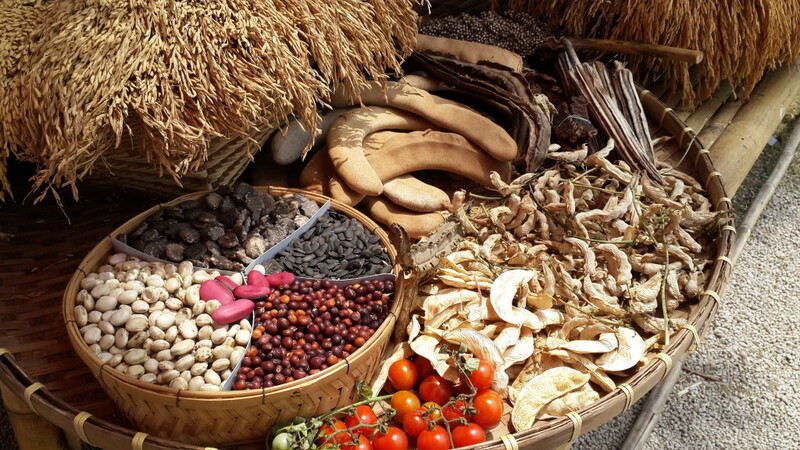 The local seeds movement spread throughout the Alternative Agriculture Network. From its origins in Isaan, the Northeast Region of Thailand, it gradually expanded to other parts of the country. The process included searching for good seeds, preserving them, and selecting the best seeds by inspecting the grains beneath the unmilled husks, so that gradually they could develop good quality seeds, with a high degree of purity. Since that time, however, in fewer than 15 years, tens of thousands of traditional seeds have disappeared from Thai rice fields, such that now in most areas only jasmine rice and a few of the government’s high yielding rice varieties are still grown. Against this trend, the Alternative Agriculture Network has recovered at least 300 seeds for cultivation, preservation, and breeding. At present, many farmers groups are able to produce their own good quality rice and maize seeds for their own use and for their group. Some have gone one step further and set themselves up as community enterprises producing seed for sale. For many years, the rice farmers in the Nakhorn Sawan network mostly grew the varieties of rice developed by the Rice Department (known as RD followed by a number). But after they decided to begin milling their own rice, eating their own produce, they found they disliked the taste, as the various high-yielding RD varieties produced very hard grains mainly for an export market. This was the starting point for deciding to develop their very own variety. The first step was when their leader joined one of the trainings at the Farmer School of the Khaaw Kwan Foundation in Supanburi. He brought back with him a few traditional rice seeds to experiment with. The seeds were preserved and a preliminary selection of the best seeds was made. The network then continued the selection process through several crop generations to keep improving the seed. They also began to experiment in breeding a new variety from 2008. They set up objectives for the kind of rice they wanted: a short, aromatic, soft grain, that can be harvested within a short time, and grown in different seasons. After planting the pre-selected seeds that they had preserved and selected dozens of breeding pairs that produced the quality of grains that they needed. A long process then began of testing the stability of the new varieties, planting a further nine generations. Different members of the group took it in turns to carry out field trials. Through their concerted efforts, the network have been able to breed 20 of their own varieties. Just last year, the Nakhorn Sawan Farmers School Network has selected its best new variety and is expecting a very good market. They have also declared publicly a list of another five varieties of rice seed that they have developed through their own skill and work. They are in the process of registering these as new crop varieties of the Farmers School Network, and are currently seeking the appropriate mechanisms within the Plants Protection Law 1999 to protect farmers rights. They want to protect their work from commercial exploitation by large-scale corporations, but do not seek plant breeder monopolisation rights, as they want to allow small farmers to be able to collect seeds after harvest and use them again. This was initiated by Mr Piroon Thongdi, who in 1979-1980 was a rice farmer in Namphrae. He began to produce maize seeds for a certain large seeds company, but later stopped growing for them because the company relocated to another part of the country. After that, Mr Piroon used the experience he had gained in selecting and developing seeds, to the point that he was eventually able to produce his own parent stock to generate F1 seeds of high-yielding hybrid maize. Two community enterprises have been established in Namphrae and Kheuanphak which continuously develop their stock. Over 20 years, farmers have gained trust that the quality of the seeds is just as good as that of the large companies, with the advantage that they are sold at more than half the price. On average, the various companies sell hybrid maize seeds at around 120 baht per kg, while the Namphrae and Kheuanphak community seeds enterprises sell at 50 baht. In just a short space of time, these two communities have been able to capture up to 10% of the market from the major seed companies, becoming an alternative for farmers who are growing maize for animal feed. In 2011, the movement formed a dedicated “Freedom Seeds” network under the umbrella of the Alternative Agriculture Network, with a commitment to support other small-scale farmers to diversify seed production. Farmers within the network are able to produce around 100 tonnes of seeds of both jasmine and traditional rice varieties per year. However these are currently only sold within the network – not enough is produced yet to be able to sell to other farmers outside the network. The Praaw Farmers Seeds Groups on the other hand, have been able to produce around 180 tonnes per year of hybrid maize seeds which represents at least 20% of the market in the North of Thailand. Nevertheless, throughout the years, the smallholder farmer seeds movement has received very little recognition and support from the government. Plant breeding is a sophisticated skill, which in the view of relevant government agencies, only large agribusiness companies with elaborate research capacity and considerable resources could manage. What the farmers have proven themselves able to do is something that government officials never believed of them. In some cases, the seed selectors had only finished primary school at grade 4. Nevertheless, smallholder farmers are developing their own new rice varieties, and some have even created their own hybrid maize seeds from parent stock they developed themselves. The community enterprises have shown that communities can gain value from their farmer’s skills. Seed production provides a good opportunity for the diversification of incomes in rural areas. The rice networks have also reinvigorated the production and sale of traditional rice varieties that are resilient to local conditions, reflect local tastes and produce high yields. Through their efforts, small farmers are showing that there is an alternative to the increasing monopolisation of the agricultural system.